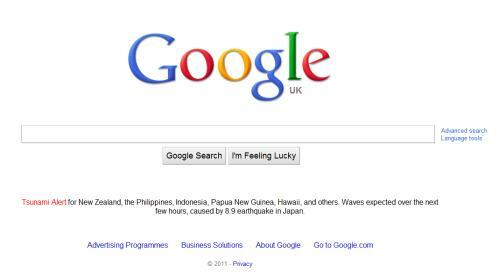 For the first time in years Google have placed something other than the simple search box on their home page. If you have seen the many images of the tsunami hitting the Japanese coast you will know how major this earthquake and consequent tsunami is. The Earthquake was recorded as being from 8.5 – 8.9 magnitude, the biggest since records began in Japan. The water is still advancing across areas of Japan, carrying cars, boats, ships, homes, entire buildings. Some buildings being carried were on fire. Wave over 10m high, taller than most houses, have been washing across farmland and devastating towns. 4 nuclear power stations automatically shut down during the earthquake, so many areas of Japan are without power already. One large oil refinery is on fire. Japan still seems calm in many areas, some panic buying, but most people are not concerned. There is a great worry for many smaller islands in the Pacific, with reports that the tsunami is now taller than many islands, meaning many people will have no high ground to flee to. A tragic event, and once again modern media is bringing constant images, videos and reports as it happens.